Rickard Norström and CRM from Microsoft : There must be people reading this blog! 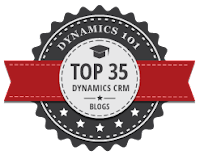 Today I was informed that my blog has been picked as one of 25 CRM blogs in the world by Dynamics101.com. It's very nice to see that there are people reading what I write, even though I sometimes get a bit to emotional to be able to see how the language I use actually looks. Looking at the rest of the list and the names ehind these blogs, I am in a very nice company with a lot of knowledge and I am very grateful to be mentioned among these very experienced people. Among the 25 blogs listed is also my good friend and boss' blog. Congratulations to Gustaf Westerlund too!